At Constangy, Brooks, Smith & Prophete (pronounced "Kun-STAN-jee, Brooks, Smith, and Profit"), workplace law is all we do – but we’re not your typical national law firm. Our clients tell us there is “a soul to Constangy that is unique and refreshing, that’s not found with other firms.” For more than 70 years, our clients have appreciated our common-sense approach and our commitment to being a real partner in helping employers navigate the prickly legal and regulatory environments of the changing workplace. Today we have nearly 200 attorneys across 15 states, offering services ranging from the defense of single and multi-plaintiff employment discrimination, harassment and retaliation claims to complex wage and hour litigation, workplace safety, and affirmative action compliance issues, as well as OSHA, to workers’ compensation, ERISA and employee benefits, immigration, and labor relations. Constangy represents a wide range of Fortune 500 corporations, small companies, government agencies and nonprofit organizations across the country. 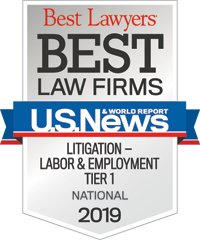 Our attorneys are consistently rated among the best by sources including Chambers USA, Martindale-Hubbell, and Best Lawyers in America, and we are ranked as a Tier 1 firm by the U.S. News & World Report/Best Law Firms survey. Our lawyers know each other. We like each other. Clients benefit from our agility and a financial structure that allows for cross-office teams with the best mix of lawyers to serve clients. The result is optimal responsiveness and consistent service across all locations. Are we the biggest firm? No—and that’s by design. We have the depth and experience of our “BigLaw” colleagues, combined with the personal service and deep relationships of a smaller firm. In fact, while we have grown exponentially over the past decade, we have more than 800 clients who have been with us for even longer than that. We are a growing and vibrant firm, yet we respect the heritage and culture that has built us into a unified team providing common-sense, practical, and creative solutions that mitigate risk and help you achieve your business objectives. We are also known for our commitment to diversity. Clients let us know that diverse teams are important to them—they want to work with lawyers of diverse backgrounds, because they believe such teams reflect their own evolving workforces—and, because lawyers looking through “a wider lens” actually bring more innovative ideas to the table. Our lawyers are not clones. We come from various backgrounds in terms of geography, economic background, and ethnicity. Some of us are parents and sports fans, and former government agency professionals and prior HR managers. We are real people just like you and your employees. Our focus is labor and employment law, and we have represented management exclusively since 1946. From Title VII to OSHA to ERISA and the NLRA, Constangy attorneys can help you keep policies up-to-date and your workplace running smoothly. We have a full range of experienced attorneys who can help you with everything from developing harassment and workplace safety policies or securing foreign worker visas, to protecting trade secrets and defending against wrongful discharge and discrimination claims. From our roots in labor relations and manufacturing, to our recent work in helping employers understand the convergence of digital technology in the modern workplace—our capabilities cover all aspects of the employer-employee relationship. With nearly 200 attorneys and a full complement of paralegal and support staff, Constangy has the ability to work wherever you need, whenever you need. In addition to bar admissions in more than half of the United States, our attorneys regularly appear with permission of the court in jurisdictions nationwide. We also have strong relationships with local counsel in many states, ensuring we can work with clients in locations across the country. We are a national labor and employment law firm of wonderfully diverse, talented individuals. We are down-to-earth, yet passionate, people who represent only management. Through impeccable and consistent legal service, we strive to obtain the highest levels of success for our clients – success as our clients define it. We empower our lawyers and sustain a culture of trust, respect, and support for lawyers and staff alike. We appreciate the importance of being on the cutting edge of our profession and seek innovation in all areas of our business. Constangy, Brooks, Smith & Prophete, LLP is a place where new ideas and solutions to challenges are encouraged, because we recognize how this enhances our performance and optimizes value for those we serve.